The competition, run by the Institute for Justice’s Clinic on Entrepreneurship, offered prizes for the top three businesses selected from the six finalists presenting at the event. The Institute for Justice (IJ) is dedicated to the motto, “Fighting for simpler laws, and less red tape,” which was was displayed alongside the lectern in support of breaking down regulatory barriers to entrepreneurship. The audience contained plenty of other entrepreneurs, all of whom were absorbed in networking and socializing. Grace Lewis, the CEO of janitorial and maintenance supply company G.T. Lewis and Associates, Inc., has been coming to South Side Pitch since its inaugural year. “I just love to see what new ideas are out here,” she said. Elizabeth Logan, who was there for the first time, had heard about South Side Pitch from another pitching event. Many audience members had come to support friends who were presenting projects. UofC Booth School alumnus Galen Williams kicked off the event with his keynote speech on entrepreneurship, in which he described his journey from making his first pitch to running a booming business, Green Delta Ventures. Williams led everyone in giving a practice “elevator pitch” after a third of the audience said they had an idea they wanted to develop. Then the six finalists’ pitches were on. Equally mouthwatering was the next pitch, by OooH Wee Sweet Tea. Mark Walker manages nineteen beehives across the city, and uses his local honey to sweeten his tea. Inspired by Walker’s distaste for Red Bull and other processed drinks, OooH Wee is focused on using natural ingredients to produce sweet tea on Walker’s native South Side, with booming sales at the Harold’s Chicken locations on 53rd Street and on the corner of 87th Street and Lafayette Avenue. The company currently has fourteen employees. Directly inspired by the times is Excuse Me Officer, or XMO. Channing Harris, co-founder and CEO, explained how his experiences coming from a family of police officers and the experiences his loved ones have had with violent and aggressive officers inspired him to create an app that coordinates reviews and recordings of interactions with police officers. Harris hopes that XMO will have an important role in both protecting citizens and protecting good police officers. Linking people together is also at the center of DashPorter, an app that provides porters when people send their cars to dealerships. 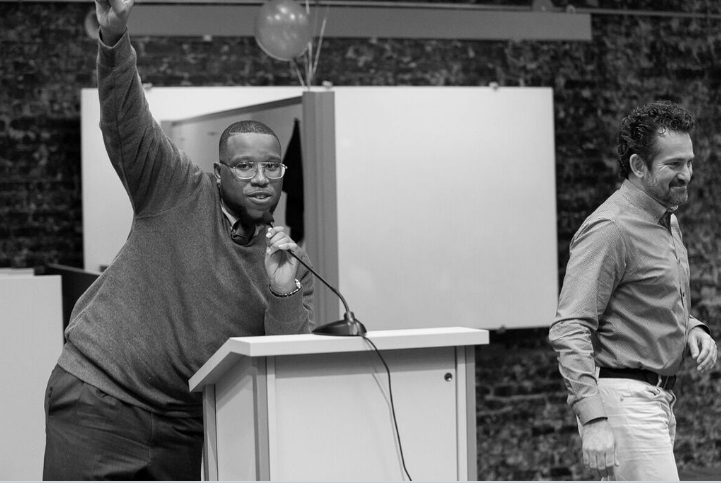 Bryan Glenn previously started a restaurant in Bronzeville and is currently operating DashPorter on the web. His near-term goals are to move coding in-house and start operating the app on mobile devices. Rumi Spice, the last of the finalists, was presented by two U.S. military veterans who co-founded the company with two other people after serving in Afghanistan. Emily Miller and Kimberly Jung connect Afghani saffron farmers to foodies and restaurants in the U.S.; they currently work with more than ninety farmers and employ 300 women during the harvest. The judges and audience alike were left to cast their votes as the event organizers looked on. Meanwhile, I sat down with Beth Kregor, director of the Clinic on Entrepreneurship. How does your legal background intersect with your experience in entrepreneurship, and what relationship is there between these two aspects of the IJ Clinic’s work? We are primarily a legal service provider, so we help them figure out how to set things, draft contracts, review contracts, and figure out the web of laws that they often find themselves caught in. All of that gives us the opportunity to help us identify what kind of problems there are in the laws that are holding entrepreneurs back, so we can agitate to change those laws. So we are very, very much grounded in our role as lawyers and advocates for entrepreneurs, and growing out of that we wanted to give this platform to showcase the kinds of entrepreneurs we were running into in our work. How did South Side Pitch begin? Can you describe any challenges you faced in getting the competition started? Well, South Side Pitch was a great idea from the get-go, so I can’t say it’s changed a lot! It’s part of our mission to showcase how entrepreneurs can be change agents for their communities, and for the world. We seek to show how powerful entrepreneurs can be when the laws leave them the space to innovate and develop these businesses, and that’s where this idea came from. We noticed that too often, the South Side is defined narrowly by people who aren’t familiar with it. Too often innovation, or entrepreneurship, is assumed to be all about tech and apps, and not about all of the amazing things happening here on the South Side. What are some of the major challenges for entrepreneurs on the South Side? What we lamentably see is that the law is too often stuck in the past, or even designed by the old-fashioned businesses that want everything to stay the same forever. Or sometimes, it’s just short-sighted. So it’s too often difficult for an innovator to break through. It’s even difficult for an old-fashioned business to break through. The process just to put up a sign in front of your store is convoluted and lengthy and crazy, but we want to work on improving the landscape in Chicago for entrepreneurs of every kind. Have you seen any changes in the landscape for businesses on the South Side in the past few years? There have been some changes; the city and the major’s office have certainly moved to push forward some reforms and open up some forums and resources for entrepreneurs, which is terrific. We’ve managed to change some laws, including the fact that now it’s legal to have a food cart in Chicago. But there are also changes such as the building where we’re sitting [the Polsky Center], which are new hubs and incubators that are focused on supporting entrepreneurs. And there are new ways for entrepreneurs to meet investors and to meet each other to create that kind of climate of creativity. What is your vision for the next several years going forward, both for the organization, and for the South Side? We seek to continue what we have always done, which is giving fantastic quality legal services for entrepreneurs in our city [and] providing an excellent education for law students who are practicing law for the first time. But beyond that, and more ambitiously, we hope to be a force for change, and a force for inspiration. So we are working harder and harder to change the code of Chicago, the laws of Illinois, to open them up for entrepreneurs, and we hope to crack open some new opportunities in the near and far future. And we hope to have more impact like South Side Pitch has, so that we can inspire people with understanding how important entrepreneurship is, how important the freedom is for someone to explore new ideas, and how important it is for communities to welcome entrepreneurs in every part of the city, state, and country. The excited buzzing during the voting break was soon quieted for announcement of the winners. Justice of the Pies placed third, OooH Wee Sweet Tea second, and XMO first. The room erupted in cheers for each winner, and those affiliated with XMO ran to congratulate each other. Mark Walker of OooH Wee Sweet Tea said that he was thrilled to have placed second, and just to have been part of the competition. Mike Shaw, one of XMO’s three co-founders, and Raven Lee, in charge of XMO’s community outreach, were both proud of the progress their project had made. “It started as this little grassroots organization,” said Lee. “We just launched in late August; we’re pretty new to the start-up world. At the end of the competition, the three businesses that received awards weren’t the only ones who felt like winners. Stacy Massey, the IJ employee who heads South Side Pitch, explained that all the teams had worked to foster a sense of collaboration throughout the process. In the weeks leading up to the competition, the six finalists had served as each other’s critics and supporters, providing feedback and bouncing ideas off each other: how does creating a porter app that tracks driver-police interactions sound? Saffron pie with saffron tea, anyone? It’s all possible.